Hedge Solutions delivers customized administration, operations, and systems support for hedge funds. With the expertise that comes from being the hedge fund start up specialist, Hedge Solutions is well-equipped to help navigate the intricacies of the hedge fund industry — and provide sophisticated services and support every step of the way. MBC aligned with Hedge Solutions in 2010, providing marketing and branding support for the hedge fund industry. 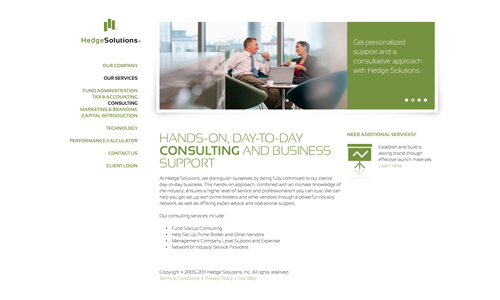 In addition, during 2011, Hedge Solutions enlisted MBC to redesign their website and update their content to better align with the direction of the firm. The new design scheme and site structure helps support Hedge Solutions’ growing visibility across the hedge fund landscape.